Upto 60% Off Lace Mats + CupCakeArt mats only £5! Four New Designs! Take a Look Below. Crystal Candy: Constantly Providing Our Customers with New Designs & Ideas! Have you ever thought of distributing or selling Crystal Candy Collections in an exclusive territory of your choice? Become a Crystal Candy Brand VIP! We offer a variety of sales positions from Distributor or Sales Agent or Brand VIP and more.....take a look at www.iepeople.info for more information. Call Andy Cleaver at Crystal Candy on 00 44 (0) 7504 931 732 for further information. Crystal Candy's TOP SECRET New Icing Formula & Technique! Providing Cake Decorators With More Ways To Be Creative! 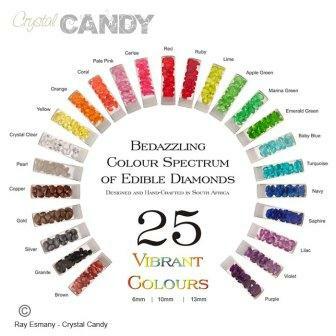 Why Choose Crystal Candy? It's all About the Design! Our customers choose Crystal Candy silicon mats for the unique, beautiful and intricate designs. They know that it's not about the size of the mat (small, medium or large), it's what's on it! We design and sell high quality, hand-made, unique silicon mat designs as well as innovative cake decorating product collections at an affordable and competitive price. Each silicon mat is made from high quality, thick and longer-lasting food-grade silicon. A thicker silicon mat means that it does not move around or buckle when spreading the icing, ensuring a clearly defined design. SIGNATURE BLEND ICING is an amazing 2D/3D icing product for creating edible lace effect strips to decorate cakes. It is highly concentrated: 100g of powder makes an amazing 700g of emulsion which in turn makes 30 - 35 strips of icing! And at a great price too! Plus we are now creating new and unique collections such as EDIBLE DIAMONDS, UNIQUE FINISH DIAMOND LUSTRE DUSTS and much more. NEW!!! Be A Crystal Candy VIP!!!!! Click Here for further information. Amazing Price for an Amazing Product! Crystal Lace Icing Only £10 for 100g!! Makes 35 Strips of Edible Lace! Tastes Sweet! EXTREME CAKE DECORATING!!! We Supply the Mat Design + the Diamonds. You Supply the Time! EXTREME Cake Decorating: THE VIDEO!!! ChocArt: Silicon Mats for Creating Chocolate Panels! ChocArt Discs In Action! In Action! New Collection! So Intense Coloured Powders. Intense, true and lasting colors. 100% concentrate without any fillers.